When we gutted the living room and the kitchen, which were side by side, one of the things we wanted to do was turn the space into an open concept lounge / entertainment area, where the 2 rooms cohesively joined together. Sounds kind of funny but it totally works. Before and after pictures to come really soon! In the lounge, we’ve built 2 ceiling-high bookcases because we’re just about obsessed with the look of them. We’ve learned that if ever you’re struggling with how to bring life to a room, a bookcase or some sort of a shelving unit is a great go-to. We’ve incorporated shelves in almost every room and it works like a charm every time. The shelves themselves play an important role in the aesthetics but what you fill them up with is the ultimate key (and also the fun part)! This here is one of the 2 ceiling high shelves in the lounge.There are many ways to style a bookcase. The #1 bookcase filler is obviously BOOKS! But not just any kind of book, they have to be pretty books :). We carefully hand-selected these ones from Value Village for $3-$5 each. Over the holidays, we actually got 25 beautiful books for $1.99 each. You just can’t go wrong. Why buy them new when they have so much more character pre-owned? 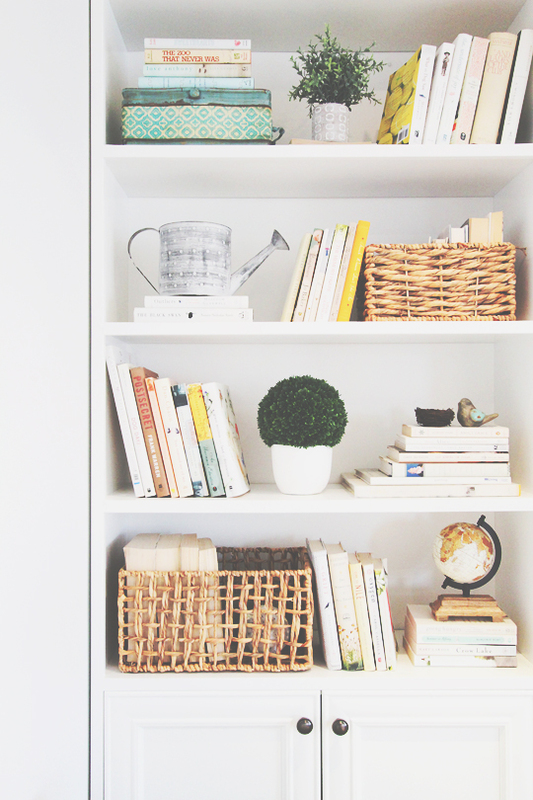 In our home, the second go-to for bookcase fillers would probably be wicker baskets. They take up space, which is great! But they also serve as storage AND they look awesome. It’s a win on all fronts. Our wicker baskets in these shelves were from Homesense; it’s generally the best place to find beautiful yet affordable ones.